Accuracy: Looks right to me. Latest intelligence reports have confirmed the deployment by the Taiidan Imperial Fleet of the Vanaar Jet Class Heavy Cruiser. The Vanaar Jet is the successor to the infamous Qwaar Jet Cruiser that has served with front line Taiidan Imperial and Republican units for over 100 years and throughout the “Homeworld War”. It is recognised as one of the leading heavy combat units in the galaxy today. 30% larger than the Qwaar Jet, the Vanaar Jet exceeds the weapons capacity of its predecessor mounting four twin cannon heavy kinetic cannon turrets and two twin ion cannon turrets. The ion cannon turrets are mounted on the dorsal and ventral surfaces providing significantly greater coverage than the nose mounted weapons of the Qwaar Jet and eliminating the rear facing blind spots. With armour, speed and acceleration analogous to the Qwaar Jet, the Vanaar Jet presents a significant threat to the forces of the Hiigaran/Taiidan Republic Alliance. Fans of Homeworld and Homeworld 2 may be unfamiliar with the Vanaar Jet which has been specifically created for the Homeworld: Requiem Wars game mod. Build time was about 12 days (but I’m a slow builder) and this was my first build up of this particular design. As such there are a number of wrinkles and distortions ion the finished model that will be eliminated in subsequent builds. 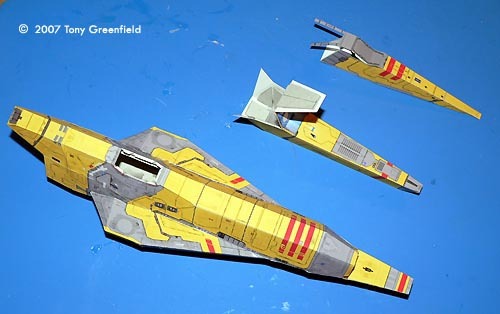 The major bonus of this model (and indeed most paper models) is the low cost of parts (a half dozen sheets of paper and ink) and the option to build as many as you want or need. 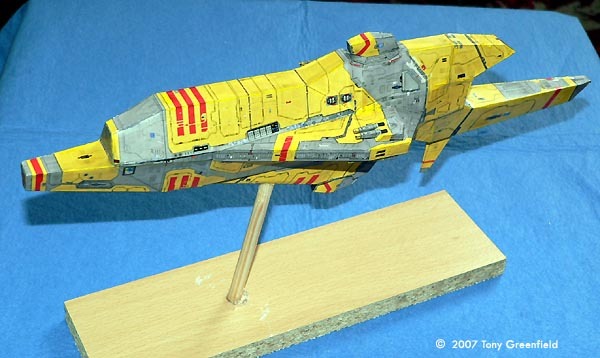 Paper models are also an excellent base pattern for scratchbuilding a model from styrene, wood or other materials. The Vanaar Jet is an ideal choice of model for a breath of fresh air if you are bored with Star Wars, Star Trek and the rest. This page copyright © 2007 Starship Modeler. First posted on 17 April 2007.